The host of the popular Travel Channel show “Bizarre Foods” is in central Iowa this weekend to taunt us with tales of gastronomic anomalies he’s downed in big cities and remote villages around the planet. In his global excursions, Andrew Zimmern has had the chance to chow down on a wide array of oddball foods and he’d love to have seconds on some of them, but knows he’ll likely never taste them again. “A great example would be palolo, a small worm that lives inside the coral reefs around Samoa and once a year, they float up to the surface, they’re scooped off the top, they’re pan-fried and schmeered on bread and they’re just delicious,” Zimmern says. “They taste like a briny, salty caviar, except it’s free.” He may return to the South Pacific island of Samoa someday, but it likely wouldn’t be on that one day of the year when the delectable worms rise to ride the waves — and be gobbled. While Zimmern says he’s annoyed by everyone asking what he doesn’t like to eat, he says his favorite dishes include — donkey. “I’m not talking about an old, crusty work burro, I’m talking about the smaller black donkeys that are used as a protein source all over China,” Zimmern says. He says there are hundreds of restaurants in Beijing that specialize in donkey, adding, “It’s some of the tastiest, most delicious meat I’ve ever had in my life.” If that donkey meat was available and accepted in the U-S, he says he’d guarantee we’d all be eating it two or three times a week. The roving chef says he also craves sinking his teeth into another steak from a kudu, a small type of antelope, something that’s extremely hard to find outside of southern Africa. While he’s in Iowa, the New York native expects he’ll come across something bizarre to eat, though don’t try to wow him with things like lefse, lutefisk or deep-fried Oreo cookies. “People forget that I live in Minnesota so I’ve gotten my share of lefse on every holiday table that I go to all during the winter holiday season,” Zimmern says. “And deep-fried Oreos are something I eat at every state fair. I think I’m up to about 22 state fairs that I’ve attended.” He says he recently went to the Arizona State Fair where the novelty was deep-fried Moonpies. While the show “Bizarre Foods” is seen in 70 countries, he says you don’t have to circumnavigate the earth to find weird edibles. People in the U-S have plenty of out-there favorities, including opossum, squirrel and raccoon. Zimmern is appearing today and tomorrow at the Wine and Food Expo underway at the Iowa Events Center in Des Moines. 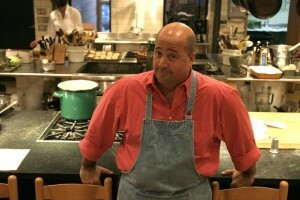 For more information, visit www.iowaeventscenter.com or www.andrewzimmern.com.